Companies throughout greater Milwaukee trust Hansen Records Management with their business documents. Our clients know the value of their office space -- space that can be put to more productive use rather than just holding boxes of old records. We can provide a complete records management system designed for your inactive and semi-active records. We offer pick up and delivery of your records, inventory reports, cost saving pricing and no hidden charges. If you are thinking of storing your business records off-site, contact us to find out just how affordable and efficient our records management services are, or if your current record storage vendor is not meeting your needs, contact us to arrange a transfer to Hansen Records Management and start saving money. 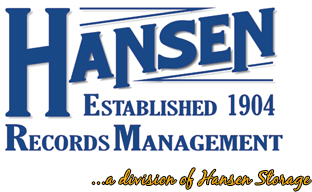 Hansen Records Management is a division of Hansen Storage Company.